SAW was everything I needed, in the right place at the right time. I learned so much in such a short amount of time. I learned from some of the most dedicated, compassionate people I’ve ever met, with 9 wonderful classmates. If you’re thinking about going there, feel free to talk to me. I think back on my time at SAW almost every day, the amount I got out of my year there is amazing… I’d probably have quit comics without Tom and Justine’s guidance. I think a lot about how much I’d get out of taking the full-year program again. "SAW is an affordable gem. Visit the school to witness a supportive environment where motivated artists are encouraged to be as weird and innovative as they desire." "I'm very happy to say I am getting more out of my time at SAW than I ever could've imagined. Under the guidance of teachers who not only know what they are talking about but also seem to genuinely love what it is they're talking about I have been able to refine my approach towards art while simultaneously learning about new methods and tools with which to execute said approach. 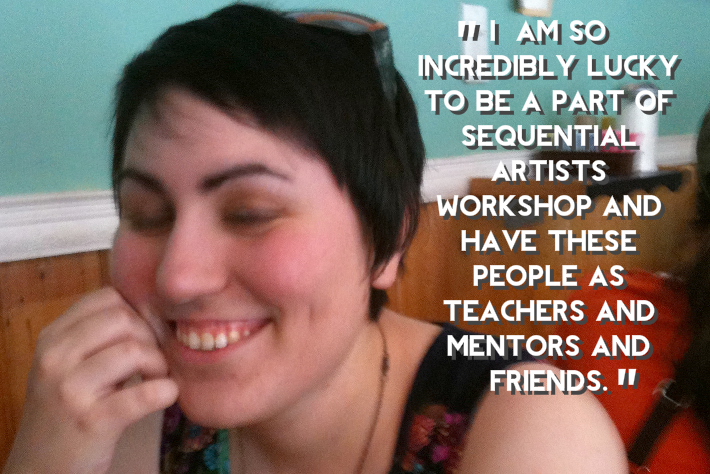 "Thanks to SAW I feel like I am on the right track to finding my voice as an artist." "I travelled ten thousand miles from India to study at SAW. I’ve lived in five countries before, and I can tell you there is something special about the people at SAW that is rare anywhere in the world. And the city of Gainesville could not be a better setting, there are people with great spirit of art and adventure in its bars and old buildings, beside its swamps and lakes, and even in its government offices. My experience here has been invaluable. I have learnt so much about cartooning, art, nature and life." "The teachers at The Sequential Artist's Workshop work with you individually and as a group to address all of these areas of concern and foster growth by equipping you with new sources of inspiration, tools, techniques and of course, with knowledge. "SAW has been the single best decision I’ve made for my creative career. It is run by some of the most generous, accepting and insightful people I’ve ever had the privilege of knowing. My classmates were equally inspiring and an absolute joy to be around. I still use what I learn almost every day, and continue to reap the benefits several months after graduating the program." "I was talking recently with a cartoonist friend who was asking me about my experiences at SAW and she asked me specifically if there was one main thing I learnt at SAW that has since been invaluable to my work. I tried to give her some kind of answer but honestly I learnt so many amazing and useful things in my time there that picking out just one is nigh on impossible. From storytelling techniques to improving my art skills all the way to the deep and varied history of comics, there is just a plethora of skills learnt at SAW that I find myself applying to my current practice. "As a course that focuses specifically on the individual's personal growth as a cartoonist, artist and storyteller, SAW was exactly what I was looking for. Unlike more mainstream art and illustration courses, SAW is small enough that every student is able and encouraged to focus on their own particular strengths. It offers not only the perfect environment in which to do this but also the amazing and dedicated teachers without whom I would never have advanced my own work so quickly in such a short space of time." Best workshop I have ever participated in, hands down. I learned as a writer, a cartoonist, and as a teacher. ...If you have any chance to participate in any of the various workshops, classes, or year-long studies at the Sequential Artists Workshop, you must! Tom Hart and Leela Corman have something special going on down there - as good a workshop as I've ever been involved with. "I’d say I left SAW feeling like I got so much more than I expected or understood I would get. I got a deep, personally catered fine art education in the fundamentals that can push my own work and style forward." Your school and curriculum are fantastic...I honestly feel far more capable of writing something worth reading after a few classes ... Also, Justine being so harsh is perfect. She actually teaches and builds on ideas. -Eric Taylor, Iowa, now Gainesville. How I know a week at @comicsworkshop did its job: I wake up every morning unconcerned with email, burning to draw & write. Totally inspiring and a few of us left awe-struck... I feel like the big thing I got from SAW was an intense drawing focus, & feeling that I can just dive in and work on stuff at anytime. "…don’t know much about “art,’ even though I’ve been drawing and writing for over 60 years. I always held the belief that “art” cannot be taught. But, looking over the SAW website, methinks that yours is the correct approch. 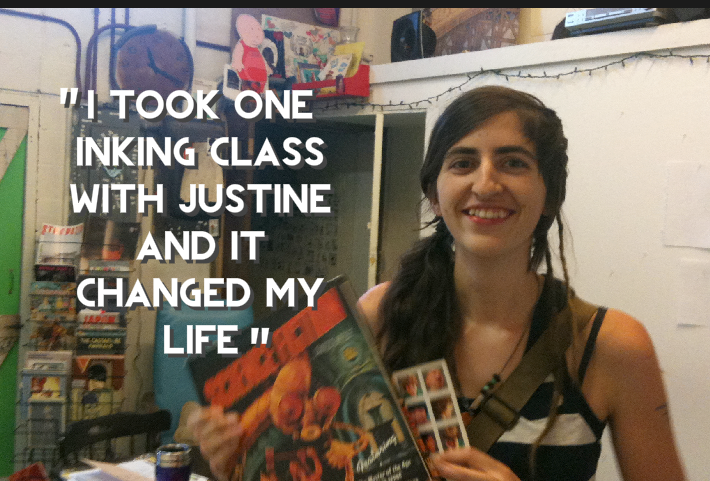 Witness Justine, the very embodyment of the artist’s profile. I’ve known her for many years, and have been a fan from the very beginning. She is extremely gifted, and will be on hand to help your students open the doors of perception." You make comic stories, story telling so exciting and fun. I know I came to you with a crazy idea of writing a story. I don’t think I’d have embarked on such an ambitious journey without your enthusiasm, boundless optimism, and most importantly, a belief in the story. -Anna K.